Leave your mark on the record books but not on the environment! Join us in reducing our collective carbon footprint in the beautiful Pacific Northwest. Anytime large numbers of people gather it&apos;s an opportunity to practice and teach environmental responsibility. In the Eugene, Cascades & Coast region, we take sustainability very seriously, and our sports events are no exception. Learn more about hosting and certifying sustainable sporting events in a Sports Destination Management article co-authored by Janis Ross, Executive Director of Eugene, Cascades & Coast Sports. Maximize social media, websites and electronic files instead of printed materials. When unavoidable, print double-sided on recycled paper with bio-friendly inks. Use biodiesel vehicles or electric golf carts for staff and athletes. 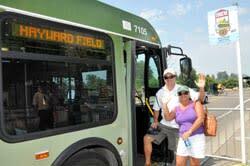 Utilize bus routes and promote shuttle service for fans. Provide bicycle racks and shelters. Request cleaning crews use eco-friendly cleaners. Choose sports planners and meeting spaces that implement green policies. Employ local companies for service and products. Utilize EWEB&apos;s greenpower for the duration of the event. Promote and honor reusable traveler mugs, water bottles and cloth bags throughout the event. Highlight local and organic coffee, wine, beer and food products for special event menus. Employ local vendors for concessionaire stands and sell local food and beverages. Serve condiments in bulk rather than individual serving sizes. Use sustainable/compostable or reusable food ware products and utensils. Place recycle and compost bins visibly throughout the venue. Make sure to donate, recycle or compost leftovers and garbage at event close. Implement a carbon off-set program by donating to local forest or renewable energy programs. Learn more about green efforts within the Eugene, Cascades & Coast region. 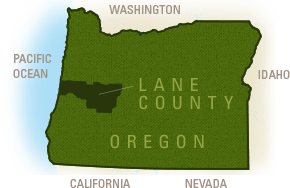 Lane County, the City of Eugene, University of Oregon and Lane Community College all maintain sustainability programs. Check out local environmentally-driven businesses and eco-friendly activities. 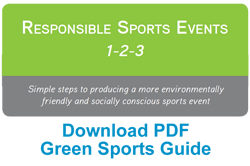 Interested in certifying your sports event as green? Check out the Council for Responsible Sport&apos;s certification program. Eugene awarded the "Green City Award," Waste Recycling and News, 2013. Eugene ranked fifth, "Top Ten Green U.S. Cities," Mother Nature Network, 2011. Eugene ranked fifth, "Top 21 Cities for Bicycling," Bicycling Magazine, 2011. U.S. Olympic Track and Field Team Trials, "Sport and the Environment Award," Olympic Committee 2008. Eugene ranked fifth, "America&apos;s 50 Greenest Cities," Popular Science Magazine, 2008. Lane Transit District&apos;s (LTD) Emerald Express (EmX), Honorable Mention, "Sustainable Transport," Institute for Transportation and Development Policy, 2008. 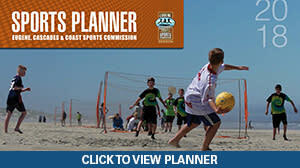 For more assistance planning a green sports event, contact the Eugene, Cascades & Coast Sports Commission at 541.743.8753.